Our range of products include eddy current electrical conductivity meter. Fitting Portable box,Probe in cable; Operating manual,Conductivity standard sample,Adapter. Instrument Case Anti-Intense Impact Water-proofing Polyester. We are offering a wide range of Eddy Current Electrical Conductivity Meter. EE0011 is a kind of eddy current electrical conductivity meter, which is designed for quick & convenient electrical conductivity measurement of material property, such as material separate quality control material state check and so on. It uses the electromagnetism testing principle. Testing objects focus on non-ferromagnetic material. The meter uses 60 KHz (aviation industry standard) to inspirit. The testing data can be read in two kinds of unit: %IACS and MS/m. Its big typeface, the back light illumination designs are advantageous for users to take the testing data even in low light condition. It uses the high property battery to make sure it keeps more running time, and because of its mini-size, it is easy to carry and to grasp hold. The design of the meter is more advantages: user can replace the probe in the outdoor, don’t need to return to the company to adjust the probe into matching the meter. It can hold measurement data. 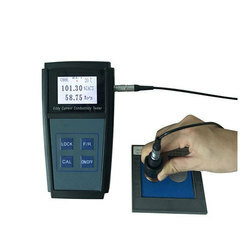 The electrical conductivity meter can be used to test the conductivity of aluminum, copper and other non-ferrous magnetic metal in the processing industry. In the aerospace and automotive industries the electrical conductivity meter can be used to monitor the process of heat treatment, the strength and hardness of aluminum alloy. Test the conductivity aluminum when it has not been oxidized. Test the purity grade of materials. Looking for Eddy Current Electrical Conductivity Meter ?